May buy 4 vouchers. May use up to 4 per group. Must use entire value in 1 visit. Each voucher is valid for either one child ticket ($15 value) or one adult ticket ($20 value). Must call Heber Valley Railroad to make a reservation; subject to availability. Valid through: Apr 22, 2016. See the terms that apply to all deals. Climb aboard for a scenic 2-hour ride along Deer Creek Reservoir. Along the way, you may spot native wildlife such as mule deer, bald eagles, elk, coyotes, or foxes. The Lakeside Limited runs Thursdays, Fridays, Saturdays most weeks. The train departs at 11:00 am and returns at 1:00 pm. 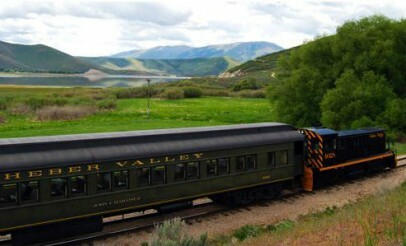 Heber Valley Railroad provides family-friendly fun aboard the historic "Heber Creeper" train. It travels South through the Heber Valley, and along the shores of the Deer Creek Reservoir. The Railroad also holds a variety of special events along with their weekly proceedings. The scenery is spectacular, there is live entertainment on board, as well as good old-fashioned Western hospitality!